Do you think you may have leaky gut after gallbladder removal? Here’s how I helped to heal my leaky gut after gallbladder removal, feel better, and support my liver. This past year has been one of learning a lot about gut health for my family and understanding why the gut is called your “second brain.” I bought the Leaky Gut course by Dr. Axe, which led us down this rabbit trail of learning about gut health. And I finally know the best foods to eat after gallbladder surgery. I am feeling better as a result of what I implemented! I am not a doctor, but I am educated about my personal health. This is my story. Your body may need something else, but this protocol helped me, so I just wanted to share it. 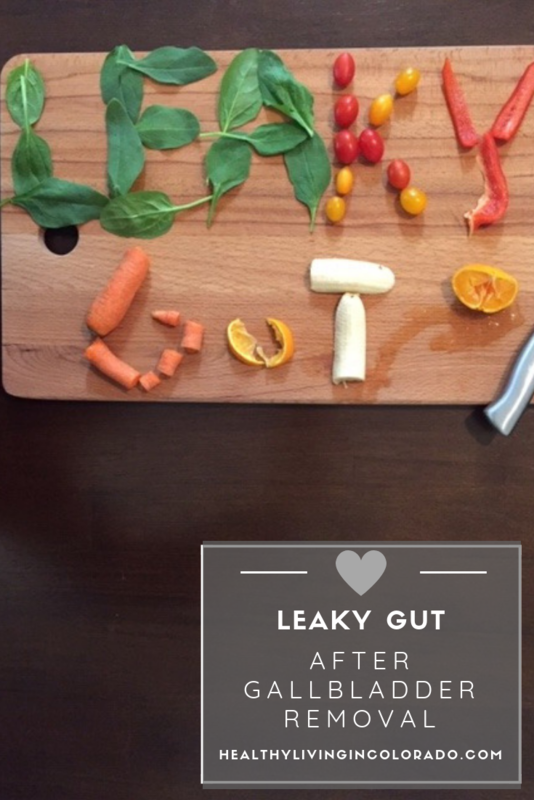 Leaky Gut is a big topic with books dedicated to understanding it. But in layman’s terms, it is essentially this. Our gut lining has tight junctions (like a seal on our stomach lining of sorts) which are there to hold our food and nutrients in place. But when we eat things that our bodies don’t prefer, like sugar, GMO’s and grains, over time our guts begin to leak little particles out. The tight junctions are loosened and it can lead to leaky gut. Chronic stress, toxin overload, medicine, tap water, and other things can also contribute to leaky gut. About 20 years ago, I was having severe pain in my gut for months. After a lot of testing, I was told that my gallbladder needed to be removed. There were no other solutions offered by the medical community at the time. There were no suggestions for supplements or helping my gut or liver. A no gallbladder diet was not suggested. The doctor did not give me a list of foods to eat with no gallbladder. He didn’t tell me about any gallbladder removal side effects even. He just said to remove the organ, and I would feel better. My gallbladder removal recovery was okay as there were not many gallbladder removal effects that I could tell immediately. I was relieved to be out of pain honestly. Fast-forward 20 years. Through Dr. Axe’s leaky gut course that my husband and I went through recently, I only just began learning about the ramifications of not having a gallbladder. When you don’t have a gallbladder, you need to take extra steps to protect your liver. The gallbladder and liver work together with bile production and recycling. So not having a gallbladder puts extra stress on your liver. I really wish I had known this over the last 20 years! I would have chosen a gallbladder removal diet long term if I had known there was such a thing. The liver is obviously one of your most important organs, so protecting it has become a high priority for me. According to Dr. Axe, there are five gut types, and I followed the Toxic Gut protocol. This is the one to use when you have no gallbladder. My husband followed Gastric Gut protocol because of GERD/acid reflux. As a side note… In Dr. Axe’s Cookbook for Leaky Gut that comes with his course, he gives you ingredients and recipes you can use. I blended what my husband could eat and what I could eat to make our meals. It worked out really well! We both followed it for 30 days, and we both felt much better when we were done. You may be wondering about a specific diet after gallbladder removal. Your immediate diet after gallbladder surgery may be a little bit different. And of course, consult with your doctor. In general though, here is a partial list of foods to eat after gallbladder removal that also follows Dr. Axe’s Toxic Gut plan. Of course, there are some gallbladder foods to avoid after surgery. Lack of gallbladder and alcohol are not the best mix since alcohol is already bad for a healthy liver. So since your liver is already strained, not drinking may be recommended. The main supplements that are good to support your liver when you don’t have a gallbladder are below. Many of them I take or have on hand. In general, life after gallbladder removal has been okay for me. My stomach does not hurt normally. But I have noticed some after effects of gallbladder removal. I learned with the leaky gut program that it hurts if I eat too much fatty meat or avocados. So my diet without a gallbladder has changed a little. Now I drain the fat off of my ground beef for example, which helps, and I only eat avocados in small amounts. And my stomach does not hurt at all now when I eat this way. Occasionally if I eat out and cannot drain my meat, I just make sure to have ox bile with me. If I take it while eating, I am fine. Another thing that let me know I had leaky gut that had improved was my skin. I have had acne for years, which is a sign of leaky gut. While I was following the protocol, my skin was the clearest it has been since puberty. I also had more energy. I had more focus and less brain fog. Remarkably, I slept better than normal which was great since I usually don’t sleep the best. Finally, my joints didn’t ache at all. They don’t ache much normally, but I did notice that I didn’t feel any discomfort which was nice. These are all things that were not super bothersome, but I do know that leaky gut was one of the problems after gallbladder removal years later. I would not have known this if it were not for the positive changes I noticed through the Leaky Gut course. Again, living without a gallbladder did not cause too many obvious problems at first. 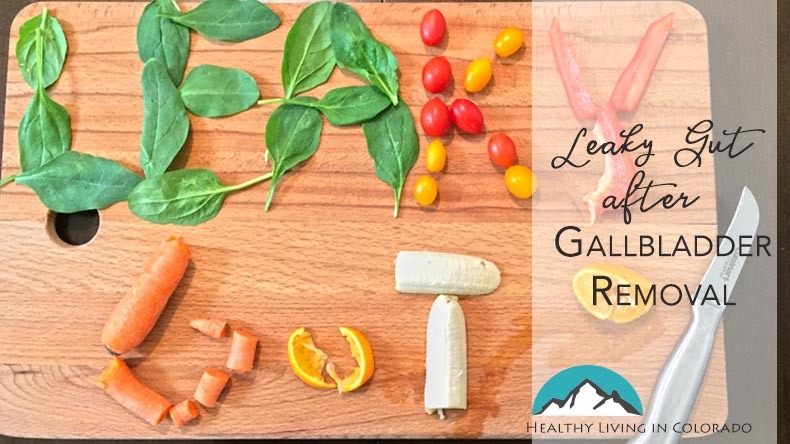 Because I had leaky gut after gallbladder removal, I followed Dr. Axe’s Leaky Gut Plan for 30 days. I don’t follow the diet exactly anymore, but I know I can tighten up on it if I begin having issues or repetitive pain related to not having a gallbladder. But what has lasted in my day-to-day lifestyle/post gallbladder removal diet/leaky gut plan is that I am more careful about fatty foods, alcohol intake, and nuts than I was before the plan. And I focus more on eating healing foods for my gut now than I did before. I take Vitamin C and probiotics at breakfast. I take milk thistle at lunch. And I take ox bile daily, especially with a fatty meal. As for detoxing my liver, I take Zendocrine detoxification blend in my water. I also take detox baths with Epsom salts and detoxing essential oils like lavender, eucalyptus, and lemon. Plus I drink detox tea. I do these things every few days, just as I feel like it. There’s no set schedule, but I try to rotate them to help support my liver. 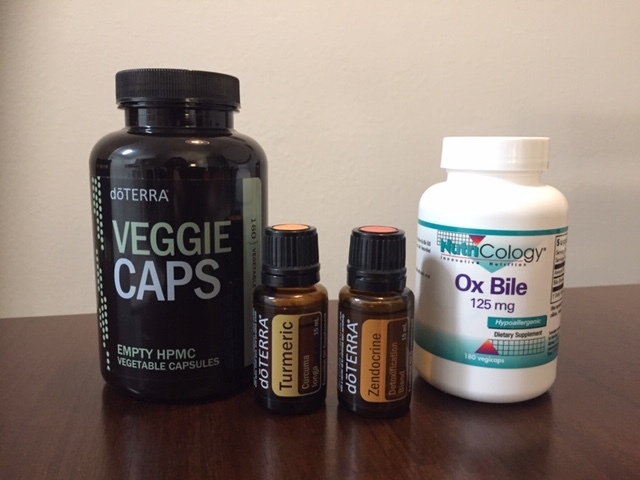 And I take turmeric essential oil (doTERRA) in a Veggie Capsule several times a week because turmeric is really good for gut health, so the essential oil is even stronger than powder. You can read more about turmeric essential oil here. And I have also recently begun taking CBD oil. This can help with cardiovascular health and it’s been proven to reduce the vascular hyperpermeability, which causes leaky gut. An organic <0.3% THC blend (under the federal limit) is made by this CBD company. Such a trace amount of THC means it won’t make you feel high, so it’s safe and healthy. I recommend this brand because they have third party testing, proving it is pure and not watered down. 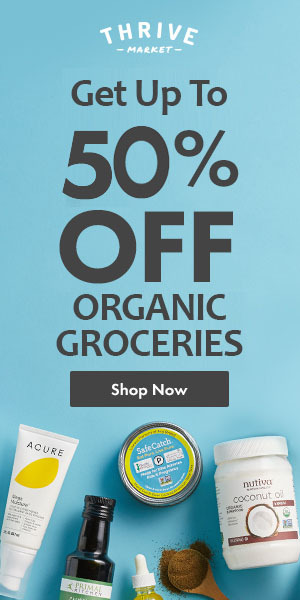 They have good reviews and a great selection of oils, lotion, and coffee. Are you having symptoms after gallbladder removal? If you want to learn more about leaky gut to see if the program may help you, this is a really helpful article by Dr. Axe. And if you struggle with motivation to take steps to improve your health, my daughter’s article on 7 Easy Ways to Stay Motivated may help. And here’s a Leaky Gut Quiz you can take to see what type of gut you may have. If you found this article helpful, please share it with a friend or on Pinterest. And comment below if you have tried the Leaky Gut Program!